Published: Dec. 23, 2018 at 06:03 p.m.
Pittsburgh Steelers quarterback Ben Roethlisberger finds his running back Jaylen Samuels in the flat for a 3-yard touchdown. Published: Dec. 16, 2018 at 04:37 p.m.
Pittsburgh Steelers running back Jaylen Samuels bounces outside for 25 yards on the run. Published: Dec. 2, 2018 at 11:22 p.m.
Pittsburgh Steelers Ben Roethlisberger finds running back Jaylen Sameuls for a 10-yard touchdown. 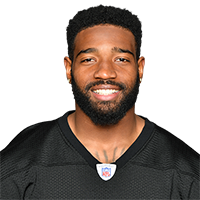 Published: Nov. 8, 2018 at 10:53 p.m.
Pittsburgh Steelers running back Jaylen Samuels runs in a 6-yard touchdown catch.